Counting Calories: Tap & Tracks lets you keep a daily food log, which lists all the food you’ve eaten and the calories you’ve consumed on a given day. With Tap & Track, you enter basic information—starting weight; gender; age; height; job type; how many pounds you want to lose per week; and your goal weight. The app then figures out how many calories you are allotted per day to get to your goal weight. The app does ask you to weigh in every day as your weight alters calories allotted per day. I find weighing in every day unhealthy. Stepping on the scale once a week seems more appropriate. It is fairly easy to select food in the database, which claims to contain about 200,000 food items. I wouldn’t say the database is excellent: When I searched for “taco,” none of the 18 options presented included a beef taco. The app also includes menus from at least 500 restaurants—chains such as Starbucks, McDonald’s and P.F. Chang’s. Many brand name foods are also included. You can add quick calories or full nutritional information. The previous meal list makes it simple to pick items you’ve eaten recently. It can be time-consuming to find food items, especially as the list grows. Entering an item into the database that is not included can take time and is a little frustrating, as you have to add all of the nutritional information for each item not on the list. Also, it is difficult to track for every single calorie consumed, such as hot sauce, seasonings, and so on. Finding exercise listings in the app is much easier. Tap & Track groups exercises by type, and the app includes everything from from unicycling to weight lifting to dusting. Tap & Track’s weight loss chart displays your progress and hard work. You can run various reports, including one on the nutritional data of the food you’ve consumed. I exported the whole log to my e-mail address, which is a cool feature of this app. In an Excel spreadsheet, I could view every day I had entered my weight. 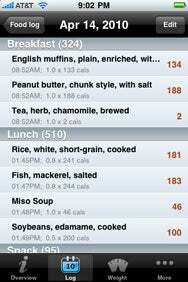 I was also able to see a daily food log, which gave me the date and how many calories, fat, sugar, and so on I ate on that day. Even my food score was listed. The third chart actually broke down each day and what I ate and how many calories, fat, fiber, and so forth I consumed. Tap & Track is a fun and simple way to track your calorie intake. The app is a great way to keep track of your weight loss.